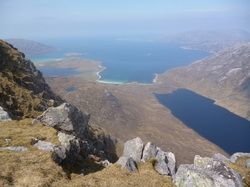 Welcome to Hidden Hebrides - the specialists in Scottish island walking holidays! We are passionate about introducing people to these amazing islands & their fabulous walks and hikes. We are the only walking holiday company based in the Hebrides - we know these islands better than anyone, and can offer an unbeatable level of personal service and local knowledge. Walking and hiking on the Scottish islands has all the attractions of mainland Scotland – mountains, glens and lochs…..but offers much more besides. Come on one of our stunning island walking holidays and you will experience some of the finest wildlife in Europe, gorgeous turquoise seas, huge silver beaches and some of the best archaeology in Scotland. A Scottish island walking holiday is a magical experience. We run a fabulous range of guided walking & hiking tours on many Scottish islands, including holidays to Skye, Orkney, Shetland, Lewis & Harris and the Uists & Barra. All our holidays are relaxed, fun & easy going - our emphasis is on enjoying the stunning landscapes, culture & wildlife of the islands. Our tours are all-inclusive: all meals, transport and accommodation are included in the price. Discover the magic of Scotland's islands at your own pace. Our competitively priced self guided holidays take the hard work out of planning your trip. Simply tell us which islands you want to visit and when you would like to travel, and let us arrange your perfect holiday. Make the most of your Hebridean holiday with one of our memorable guided day walks on Lewis and Harris. High mountains, wild coastlines, gentle machair rambles......we can do them all. We even run Tea Shop Safaris - easy going wildlife rambles, with a nice cafe thrown in! 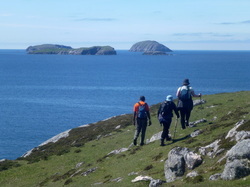 ​A wonderful trip highlighting the very different island landscapes. Mick, our guide, had everything timed to perfection which meant we could relax and enjoy the walks to the full. There was never a dull moment. This was my third Hidden Hebrides holiday and I am already considering the options for number four! This walking tour was the highlight of our trip to Scotland. We loved our fellow walkers and our guide, Emma, who lives on a croft in Lewis. They got this right, from the small group size, to the pace of the day, the accommodation in Stornoway, the meals at night and the scenic walks. I can’t praise this experience enough, and hope to return one day to do another part of the islands. J.K. (Kansas USA). Harris, Lewis & St. Kilda, May 2018. A wonderful week with guide, John.. Best beaches, wildlife, flora and fauna, history, breathtaking views around every corner and John's knowledge of the history and hidden places made the walking holiday perfect. Military precision and perfect planning meant everything​ ran to plan - thanks Mick. Choice of B&Bs of a very high standard plus Mick and John's favourite eating places made the holiday very special. Already thinking about next year! Would not hesitate to book again. B.S. (Lancashire UK). Outer Hebrides Highlights, June 2017. I have just returned from an amazing walking holiday led by our guide, John. He is a super guide and host! Apart from the fantastic organisation of ferry bookings, B and B's, evening meals and walking trails, John added the unflappable, always on time, courteous, generous element to this trip. His knowledge of the islands was outstanding and passionate. At last count our group had identified 45 birds,visited 10 islands, learnt about crofting, visited Neolithic remains from 5000 years ago, saw a scheduled plane land on the beach, visited Harris Island distillery and remained sober(ish). Thank you Hidden Hebrides.